What are the most important lessons you’ve learned in life? What are you most proud of? How would you like to be remembered? These are just a few examples of the questions Arts Partners Wichita teaching artist Aaron Fowler has his students ask when they meet the elders that they will be working with over the course of a five-day residency. These questions form the basis of the Stories to Songs: Wisdom for a New Generation residency during which students will take the answers to these questions and more and weave them into songs that will tell the stories of their community. Music brings people together. This statement has held true since the inception of the concept of putting rhythm and pitch together into organized forms. Even as music evolved through the ages from prehistory to the chant music of the medieval era, opera in the Classical period and finally to the popular music of today, the goal of the musician has been to bring people together through shared expression, story, and emotion. Fowler, a lifelong musician, designed the Stories to Songs residency with the goal of using this inherent trait of music to bring people and communities together in order to connect students and their elders and uncover their own personal stories. The residency is a powerful oral history project that engages elders with middle and high school students in a process called collective songwriting. The process begins with an interview where students work with an elder from their community to help craft and shape a narrative for the culminating song. On the second day of the residency, the students are introduced to a simplified songwriting process which includes a discussion of themes, song form, and the use of rhythm, beat, pulse, rhyme and melody to build a successful song. During the third and fourth days of the residency, students work to compose the lyrics and finally the melody of their song. 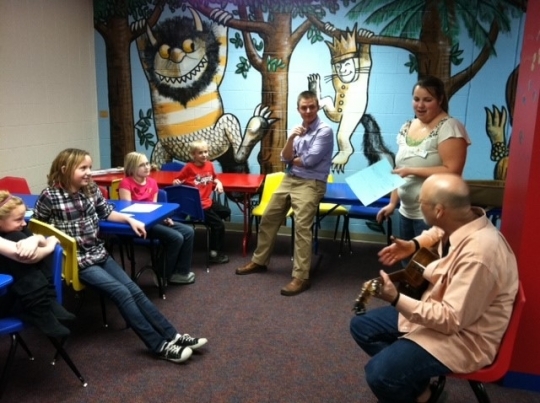 On the final day of the residency, community members are invited to come into the class for a special performance of the song by the students. Fowler believes that the communities involved in the Stories to Songs program are brought together through this process and both students and elders leave the program with a greater sense of appreciation and understanding for the lives and experiences of their community members. "The power of this cross generational musical experience has life changing benefits. I still hear stories from students and elders about their experience of working together on the Stories to Songs project. In terms of why music is such a vital component of this experience, I believe Yip Harburg’s words 'Words make you think thoughts, music makes you feel a feeling, but a song makes you feel a thought' sum it up well. That is what song writing does for students and community elders in this project."